My sister Nancy lives in the midst of music, mayhem and madness in the shadows of the vibrant Loop in St. Louis city. Yet her yard is a true get away in the midst of city living. Yes, you can hear the drum circle at the Shell gas station a block away. Police and firetruck sirens blare down Delmar Avenue at a fairly regular pace. A rotating “moon” atop the Moonrise Hotel can be glimpsed from the deck. But all that is just a sideshow. 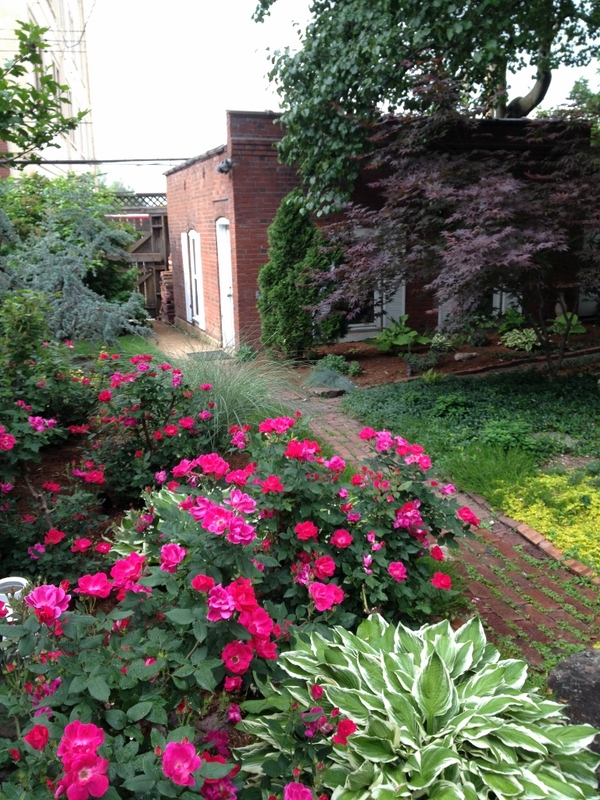 The main event is the oasis she has created on a small city backyard lot. Center stage is a large pond full with fish and surrounded by lots of ground cover such as carpet phlox, creeping Jenny and vinca; trees and shrubs such as Japanese maple, lemon thread cypress, Mary Jane magnolia,and oakleaf hydrangea; perennials such as hosta, grasses, salvia and liriope; and annuals to fill in. 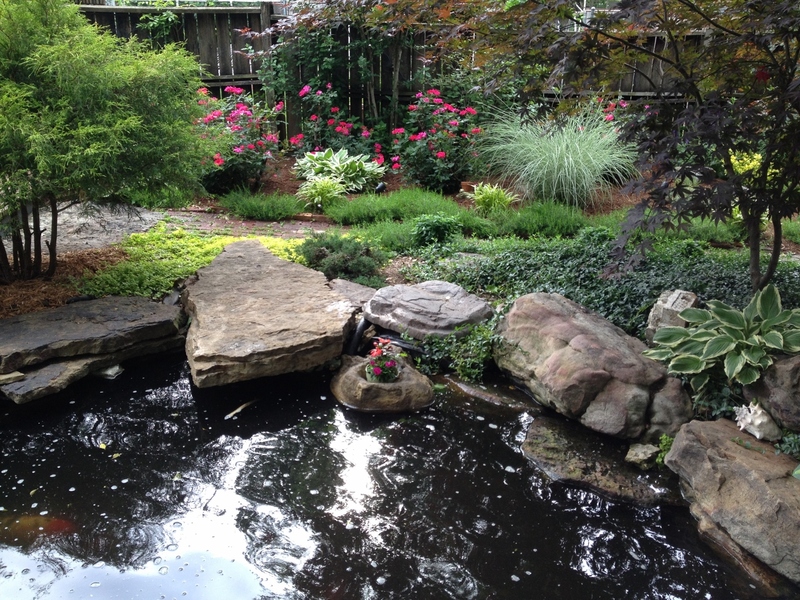 Large rocks give structure to the pond shape and provide a platform to gaze at the fish and maneuver around the pond. If you’ve ever wondered if pond water is good for the garden, wonder no more! Her oakleaf and roses appear to be on steroids! 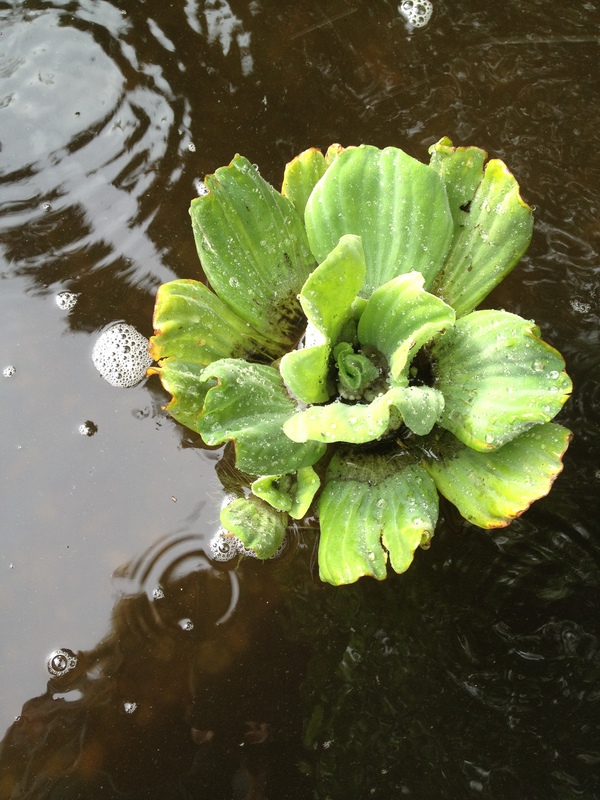 Of course the pond has aquatic plant species such as water lily, water hyacinth, water lettuce and bog plants. What Nancy lacks in plant knowledge “I don”t know that plant is,” she makes up with an unerring eye for color combination and layout. There’s a balanced interplay between citrus hues (lemon thread cypress), cool tones (a blue dwarf weeping cypress) and shocks of color (the pink Knockout roses). 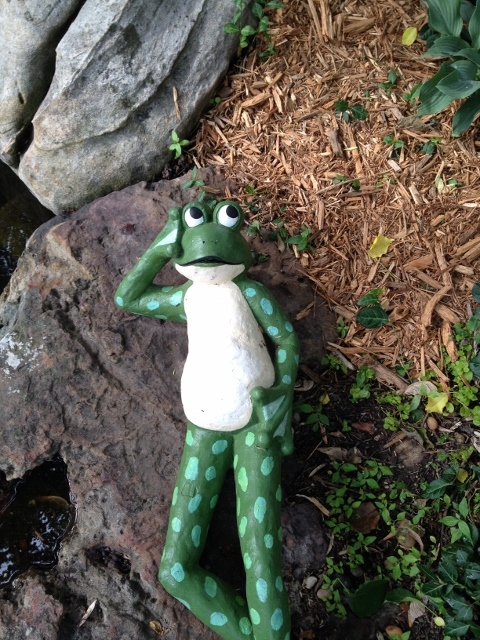 Touches of whimsy, such as this painted frog, let you know the garden is for enjoyment. This frog is an example of her talent in painting. A painted frog adorns the rocks on the edge of the pond. I think ponds provide a sense of serenity and the shade cast on the pond from the trees lends a sense of calm in an urban setting. I am always struck by the fact that the yard is small–a typical St. Louis city lot–and there is lots of city noises around, yet the environment feels set apart from the hustle and bustle. 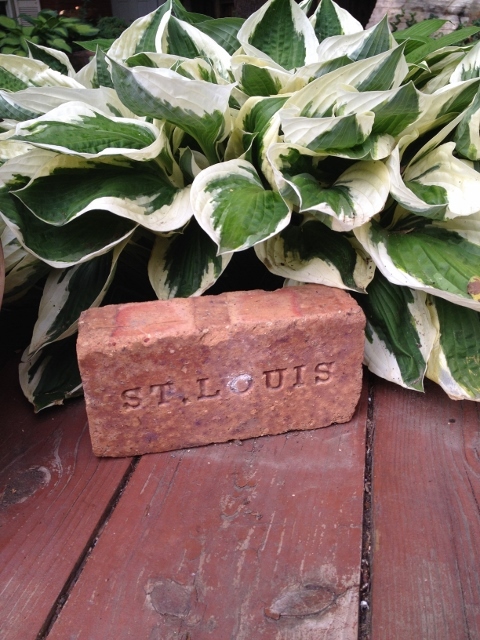 Original St. Louis accents also lend an authentic city touch to this escape and sets the yard apart from other gardens. The home is in Parkview, an historic St. Louis neighborhood dated back to the early 1900s. Above the bed in front of the garage is a light from one of the old streetlamps in the neighborhood. And the first picture in this post is of an old “St. Louis” brick. Looking back toward the garage. Note the dwarf cypress in the back. Behind this is another planting area that hides the power line and the fence leading to the alley. Between the garden beds, the deck and the pond, you kind of lose sight that this is really a narrow yard that is not all too deep. That is because the design draws your eye down along the space. A brick path along the side bed with the roses help to pull your eye lengthwise. Still developing is a shade garden in front the garage. As with all gardens, trial and error occurs with plant selection, soil and light. This area receives a good bit of shade and Nancy has struggled a bit to get the right plants to take off. Carefree, foliaged perennials are the name of the game, although color contrast is at the forefront. Hostas thrive in the St. Louis climate. 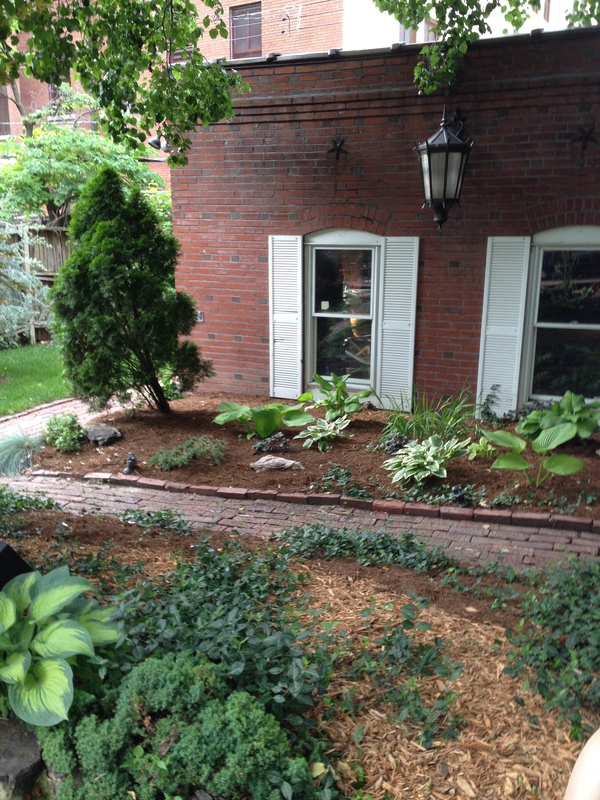 Nancy is planting a variety of hostas, and the bed is beginning to take off. I know, however, that in a year or two she’ll introduce an artistic element to heighten the enjoyment of this bed. What I have not shown you are the window boxes and containers that overlook the deck. And of course there are the lounges and the hand-painted table umbrella. I hope you have enjoyed this virtual garden tour. I look forward to sharing other small garden spaces in the near future. How are you making the most of your small spaces? Categories: Inspirations, Musings | Tags: creeping Jenny, Delmar Loop, dwarf cypress, garden art, Japanese maple, liriope, Mary Jane magnolia, Moonrise Hotel, Ornamental grasses, Pond gardening, salvia, small gardens, St. Louis, threadleaf cypress, water hyacinth, water lettuce, water lily | Permalink.